I haven't been this excited about an organizing tool in a long, long time. Most organizing products are minimally helpful, but this thing makes me smile every single day. I got a ScanSnap S510 Instant PDF Sheet-Fed Scanner for Christmas, and it has completely changed how I deal with paper. It is basically a tiny scanner that can handle huge amounts of paper at a time, produce high quality images, and it even allows you to search within your documents with the bundled OCR software. It takes up very little room on the desk, so you don't have to haul it out every time you want to scan something. Just insert the paper and push "go" and you're off to the races! I use it for incoming paper that I would like to keep around for a while but that I don't need in the original (e.g. utility bills). Then if I ever need to look up something I can find it in seconds and it is already scanned so I can send it as an email attachment immediately. I also love it for all my graduate school readings. I have a huge filing cabinet full of photocopied articles that I need to keep for reference, but I hate that they take up so much room. With this scanner, I am slowly whittling down the pile so that I can have all my readings in searchable PDF form, AND I can even make back-up copies. Pretty soon I can trade in my huge filing cabinet for a couple of DVDs, and that just makes me say "aaaaahhhhh." If you have a lot of catalogs cluttering up your home, you can just plop in the pages that interest you and keep them in a folder on your desktop, leaving you free to ditch the originals. This probably will also cut down on your impulse buying from catalogs, which means less "stuff" for your home! I'm sure there are tons of other uses for this handy machine that I haven't even thought of yet, but using it even just for these uses has practically eliminated paper clutter from my home. I mean it. I have no piles, no giant tickler files, no bits of scrap paper on the fridge. It is fantastic! Of course, this does not come for cheap. It is listed in the US at $495, but we got it in Japan for about $400. Still, that's a hefty price to pay, but for me it was worth it to eliminate paper from my home. This doesn't mean you can just dump all your scans into a single folder on your computer and be done with it, but organizing those folders is a topic for another day. First of all, they have square corners, which means no wasted space in your cabinets. And, they are stackable in various configurations, which means no wasted vertical space! 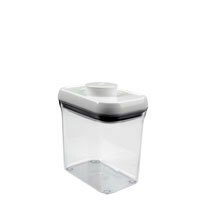 They also create a suction seal when you close them, so things stay fresher longer, and no worries about bugs (for those of you in tropical climates). The only drawbacks are that they are a little pricey, and they are not dishwasher safe. Still, if you can afford it I would recommend getting some skinny but deep ones for your staples (flour, sugar, coffee, etc.) so you can make the most of your cabinet space. You could get smaller ones for coffee and tea and stack them. I use a lot of dried ingredients that come in unwieldy plastic bags, and these would tidy up my cabinets in no time. Ooo, the possibilities! Cool organizing tool or useless paper magnet? I think this is a neat idea, but only for those who have tamed their natural tendency toward chaos. If you already have a mail system set up where things actually flow through rather than pile up, then this would be a good way to keep your horizontal surfaces clear, and that always makes your home look neat and clean. You could even designate areas for each person's mail (top right = me, top left = you, etc.) 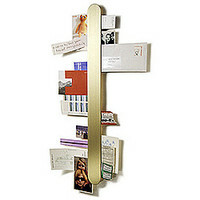 This thing looks more like art than an inbox, but that being said, imagine how it would look if you never removed anything from it. Yikes. Isn't this a cool idea? It may not work in every home, but I LOVE the idea of keeping stuff off the floor. It makes for easy cleaning (no need to bend over and pick up shoes to sweep under them), and it's a nice clean-looking design. I think it would also work well if you had a shallow wall-mounted cabinet above it to stash your mittens or sunglasses or other things you need when you go out. After my daughter started to crawl I learned the beauty of storing things as far off the ground as possible. At first a coffee table did the job, then the dining table, then the computer cabinet, and now that she has learned how to climb I am fantasizing about hanging everything from the ceiling, kind of like a backpacker's bear bagging system. Granted, that wouldn't look so cool, but I have seen one storage idea that does look good, and it keeps all your stuff off the ground: very high shelving. One of the best things about this storage system is that it keeps everything out of your direct line of sight, so the rest of your place always looks clean and tidy, even if you still have lots of stuff (which you should really consider ditching). I think it works best for books because you wouldn't have to do a lot of active dusting; just get some cheap fabric, cut it in strips and lay it across the top of the books, then throw the fabric in the washer a couple of times a year. I have seen people try this high shelf idea with stuffed animals and it looked good, but again it's all about the dusting, and I doubt the fabric would look so hot on those. I wish I could do this in my house for all my books, but we live in an earthquake-prone area. Enough said. 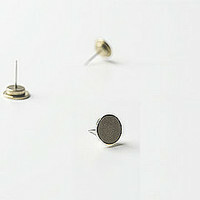 I just found these tacks online and I am in love. You can just push them into your drywall and you have a place to hang all kinds of (metal) stuff! This lets you use your wall space for simple storage, but you don't have to install any shelving, and when you are not using them there is nothing there to take up visual space. You could even paint or wallpaper them to match your walls and make them truly invisible. These would be great for apartment living since you can't install shelves directly into the wall anyway. Others have suggested that this would be a good way to hang fabrics or prints without a frame by holding them up with a small piece of metal opposite the magnet. If you are going to do this though, I would suggest keeping a bunch of magnets together in some kind of grouping. Otherwise, wouldn't it just look like your messy floor moved to the wall?